Dalton's Alumni, now almost 6,000 strong, live steps away from 89th Street and as far away as China, the Philippines, Finland, and New Zealand. In its ranks are artists, scholars, musicians, physicians, educators, lawyers, business leaders, actors, writers, scientists, homemakers, journalists, and public servants, who are unified by the solid foundation of a Dalton education. Many Dalton Alumni who have 'gone forth unafraid' later return to give back to the school; some serve on the Alumni Council, while others speak to students about their careers during classroom visits or at high school assemblies. Alumni also give generously of their time and resources to provide internships and career advice to younger alums. We are always gathering Class News for Connections magazine. Have you recently gotten married or engaged? Were you promoted at work? Did you start a new business? Any new grandchildren? Have you done any globe-trotting? Your classmates want to know what you're up to! Email details and high-resolution photos (.jpgs are best) to Debbie Freeman at dfreeman@dalton.org. 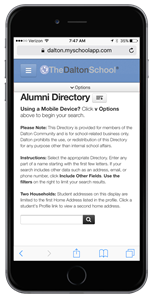 As a Dalton insider, get school news, announcements, a comprehensive Media Gallery and access to the online version of the Daltonian Newspaper. Get your username and password today! Contact dfreeman@dalton.org.